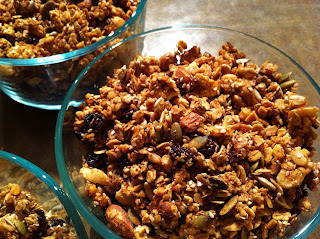 Generally, I prefer to eat nuts and seeds raw to ensure that I get the optimal benefit from the anti-oxidant rich essential fatty acids found in nuts and seeds, but with the cooler weather I decided to make a baked nut and seed granola. 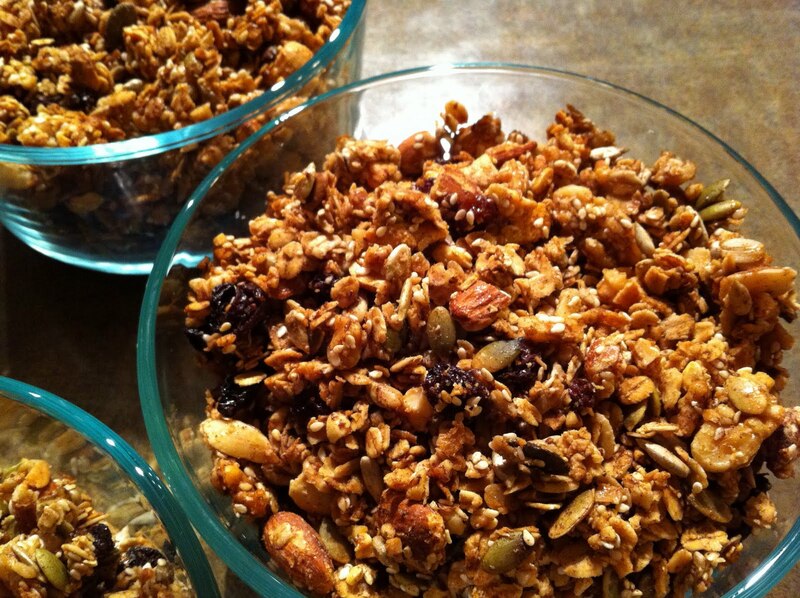 With all the nuts and seeds in the granola, it is very protein rich and it makes a great fortifying snack (or breakfast). I have the granola with rice milk and it tastes delicious! 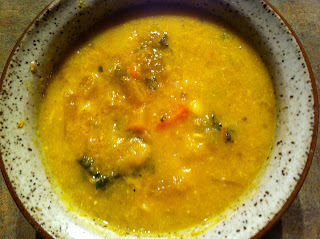 The fall is a great time to integrate some of the delicious squash that is so readily at the local farmer's markets. I picked up a few small sugar pie pumpkin squash at the Strathcona farmer's market a few weeks ago and today I decided to make pumpkin soup. Place olive oil in large soup pot over low heat. Add onions and garlic and saute for 2 minutes. Add leek and celery and saute for another 2 minutes. Add squash, carrot, zucchini, turmeric, cumin, ginger, and sea salt and saute for another 8 minutes. Add water, bring to boil, and reduce to simmer for 20 minutes or until squash is tender. Remove from heat. Blend cashews and rice milk together with a hand blender (or in regular blender or food processor) to make cashew cream and add to soup. Add kale and lima beans. Dish up and enjoy! This soup was warming and delicious (I also added a Doctor Kracker seeded spelt cracker to round out the meal)! 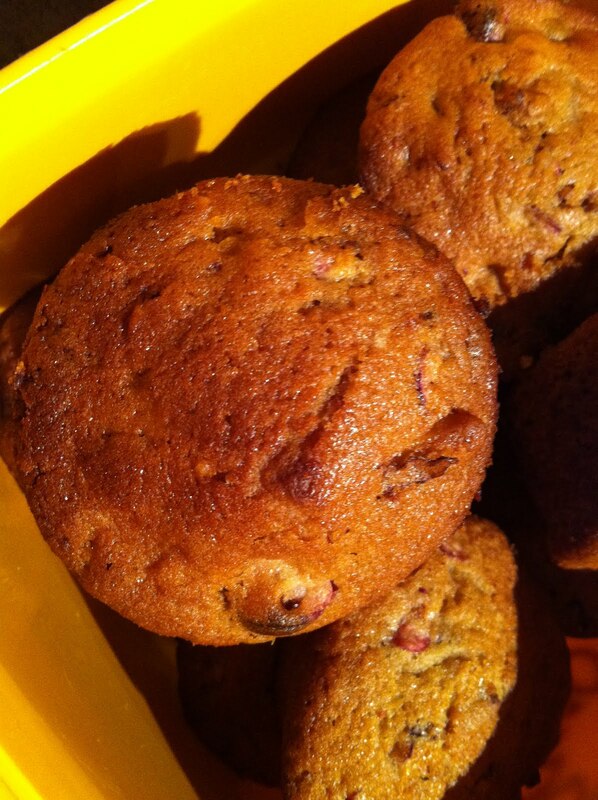 To celebrate the fresh cranberries still available at the store after thanksgiving, I decided to make muffins! Preheat oven to 375 degrees. Lightly canola oil muffin tin. Mix spelt flour, non aluminum baking powder, baking soda, and sea salt in a large mixing bowl. Add non dairy milk, canola oil, unrefined sweetener, lemon zest, and vanilla to dry ingredients and mix until half way blended. Add cranberries and walnuts to mixture and mix until fully blended. Place mixture into muffin tin and bake for 23 - 27 minutes. Remove from oven and allow to cool. These muffins are very tasty and not overly sweet - a nice fall time snack!